Man, I should do more paper doll sets. I’ve been meaning to do some for Skin Horse, but you know how it is. Wow! Valerie Kaplan is the fount of all that is adorable. 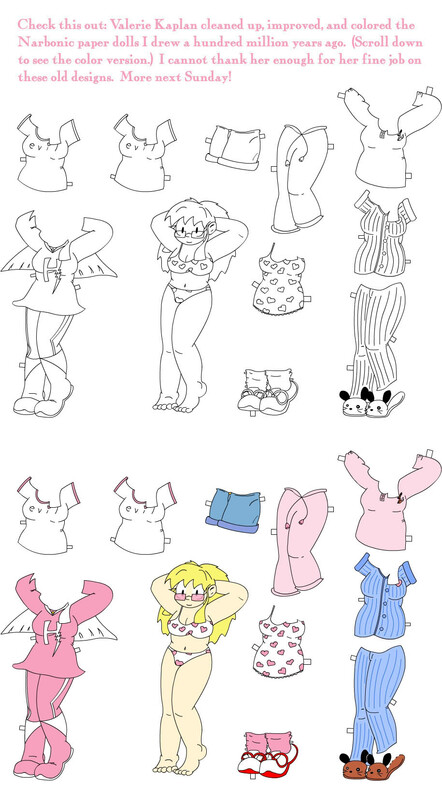 I kept meaning to print and cut out the paper dolls, and now I shall. Skin Horse paper dolls would be so fabulous, but Tip alone would require an entire book (pretty please). I’d rather have a paper doll that looks like Helen N.
I’m glad to have a paper doll that looks like Helen N.
In my undies … with my sundries! And dress me as you please! She does things that are bad! See right there? On her shirt, it says “evil”! You can help her to dress! Yes you should! If you don’t, well then, we will! She’s the evil girl of my dreams! If there are such great paper dolls, can there be any doubt that we would be far away from a Narbonic/Skin Horse paper animated series? So can we look forward to a Flash animation Narbonic dress-up game in the future, nyao? Skin Horse paper dolls seem problematic, in that half the main cast doesn’t wear clothes (I’m counting both Nicks to get that number, and not counting Moustachio’s hat), and one of those that does changes body parts (or entire bodies) as well. I suppose you could make up for it with Tip’s wardrobe, and little hats and goggles for Sweetheart. And dark glasses for everybody. Bringing in the secondary cast offers richer options, of course; particularly Tigerlily in stuff you really have to be Mad to pull off, and an entire range of adorkable pajamas for Dr. Lee.